Our umbrella association for the faculty of science, Olympus, is celebrating their 15th birthday. These are all the epic activities that are going down that week. Soon the whole faculty will become unsafe for us beta’s. On the 11th of april, the lustrumweek and thereby the poaching season will start. A big game of gotcha will be played and hunters could be everywhere. Every participant will receive a target.The goal of the game is finding and shooting your target, without any other participant seeing. If you succeed, you receive the target of the person you killed. While you are off hunting, you are someone else's prey aswell, so keep a close eye on everyone! Because even you could get trapped. It’s going to be the survival of the fittest so make sure you sign up for the 7th of april! Sign up here: https://goo.gl/forms/tbT9oEvp1V73WJjI3. On the 11th of april from 17:30 till 21:30, in the North Street and all surrounding lecture rooms. Keep an eye on the site! Temperature is rising, spring fever is coming back, it’s time for the next edition of BeestFeest! Dress up as your favorite animal because next edition will be themed Jungle at Night! 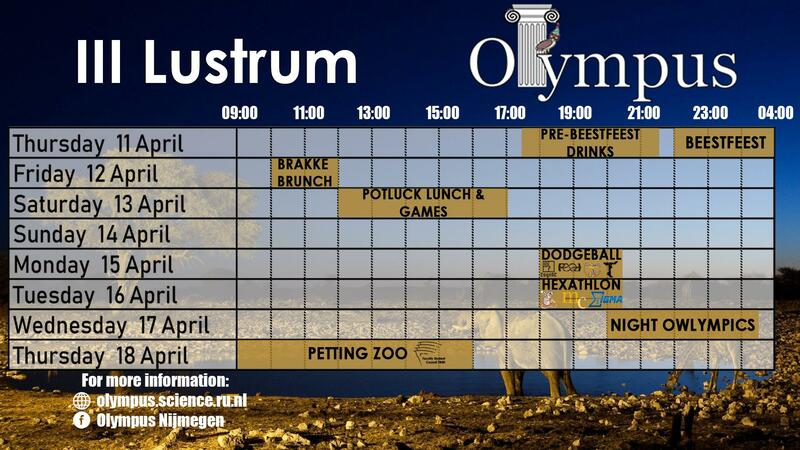 Next BeestFeest is extra special because it will be held during the lustrum week of Olympus! We therefore have asked a very special artist to come to this BeestFeest, the Gebroeders Scooter! The BeestFeest will be held on the 11th of april from 22:00 (one hour earlier than normal) until 05:00 on the 11th of April. Members can enter for 3,00 and the non-member price is 3,50, see you in Doornroosje! After we had a great party during an edition of BeestFeest, you might feel a little bit a sloth or a snail afterwards... Maybe you're still recovering from the night before, maybe you feel great, it doesn't matter how you feel because you can enjoy a luxury brunch between 10:00 and 12:00 in the morning after BeestFeest in the South Canteen for 50 cents during the 'Brakke Brunch'! A potluck lunch, the idea couldn't be more simple: make something for lunch, bring it with you and get to taste many other people's dishes! Olympus will provide drinks and games. Come to our picnic on Saturday 13 th of April from 12:00 till 17:00 in Brakkensteyn Park. We'll be playing dodgeball on the 15th of April from 18:00 till 20:30 in Brakkensteyn Park, together with our friends from Desda, Leonardo da Vinci and Thalia. Keep an eye out for the website! For all the late night owls, in de night of wednesday 17th of April there will be a legendary battle for the best study association at the North Street of the Huygensbuilding, the olympic games! From 19:00 till 2:30 there will be a lot of different games and activities. You can win medals (gold, silver or bronze) for your study association. Starting with an opening ceremony were every association can place a joker on a game to double the amount of medals to win. May the best association win! That's it. We hope you'll be able to join at least a few of these activities!